Yahoo Search Marketing has basically been using the same auction bidding system since GoTo.com launched nearly 8 years ago and with the new direction of the Yahoo company and the success of Google AdWords, the public (advertisers) have been screaming for a new up-to-date system which compliments the diversity of the Yahoo Network. 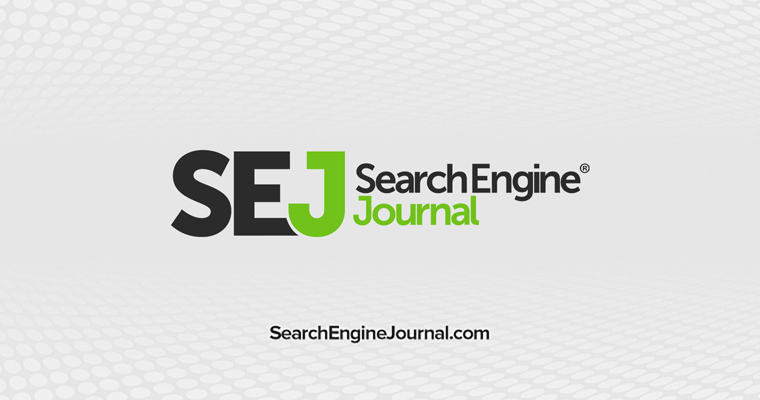 No longer is search engine marketing soley the sponsored links above and beside (or integrated within) organic search results, but in Yahoo’s case the company has expanded search beyond the box and into their most used and popular channels. Enter Yahoo Trip Planner, Yahoo Answers, Yahoo News and Yahoo Local. All remarkable and defining offerings from Yahoo which have a glimpse of its (and ours) online future, which also grows beyond the PC and into our pockets, cellulars and navigation systems. As a past advertiser and Yahoo Search Marketing Ambassador I have shared the frustration of many in the search marketing field when Yahoo launches a new service, take Yahoo Local City Guides w/ integrated Answers for example, but no basic geotargeting system to efficiently serve specific ads to that specific market. It’s time for a change and such a transition is coming soon. 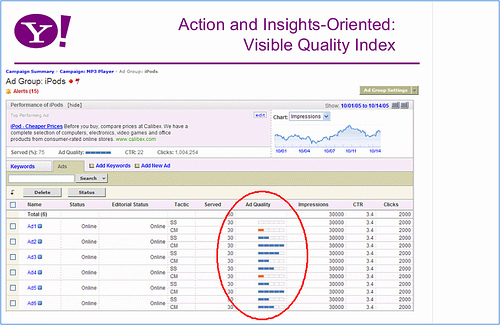 The new Yahoo Search Marketing application launch schedule has been set with the new Application Launch in Q4 2006 and Ranking Scheme rollout in Q12007 (but perhaps before Christmas shopping season). Yahoo Search Marketing has been working on the planning of the application for 5 years along with up to 1,000 private testers of the new Yahoo Search Marketing system. 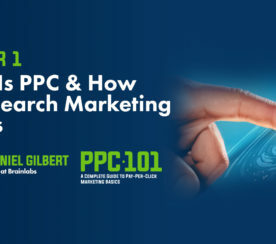 The first system change is probably the most relevant to current advertisers; the Yahoo Search Marketing pay-per-click price checking system. The pricing system will transform from auction clicks to a newer more marketable PPC system based upon ROI and Quality Score (dumping auction set-up). Marketing focus with emphasization on quality, multiple segment targeting, and the management of those objectives. Targeting, like PPC, is more than keywords and creatives are beyond text with graphics and user media. 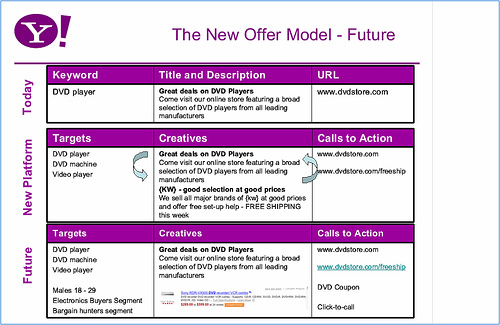 Calls to action will go beyond target URL with couponing and specific landing destinations geared towards the user’s web surfing application of choice – mobile PDA, laptop, cellular, PC. 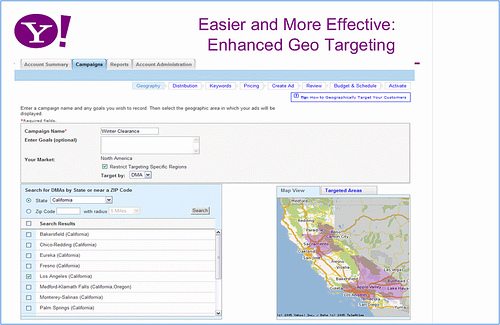 Set up begins with the definition of geotargeting which is determined by the advertiser in a new system which empowers the user to select specific local DMA’s and area zones with help from a Yahoo Search Marketing mapping system. Secondly the campaign is named by the user, sponsored listings or contextual match are selected, then Yahoo helps the user determine keywords with a new recommendation system. The advertiser then selects pricing via a new Yahoo CPC/Click system which works via a slider bar mechanism which provides a landscape of bids & clicks. This way, the advertiser can set up their campaign to provide a certain amount of clicks while Yahoo also informs the advertiser of shares of potential clicks and their competitive market within the Yahoo Search Marketing marketplace. 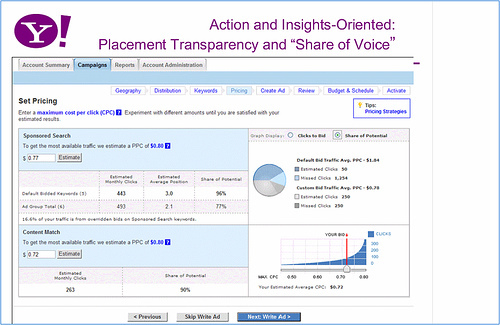 Yahoo now also lets advertisers insert dynamic keywords into their title and ad copy along with a Yahoo powered split A/B testing service which can be optimized by Yahoo, or manually via the advertiser. Budgets can be set at both the account and campaign level, letting particular test or differently targeted campaigns run on a certain percent of the budget. Dayparting (even coast to coast differentiation) and campaign scheduling are planned to be part of the system, which should help newer marketers get a campaign up and going over a certain amount of time more efficiently than in the past. Yahoo has set up a notification system similar to YPN called Alerts which let the advertiser know when keywords are declined, budgets are reaching critical mass, and billing or credit information. Alerts can also be customized by the advertiser so YSM is informing the user with customized information critical to each specific campaign. 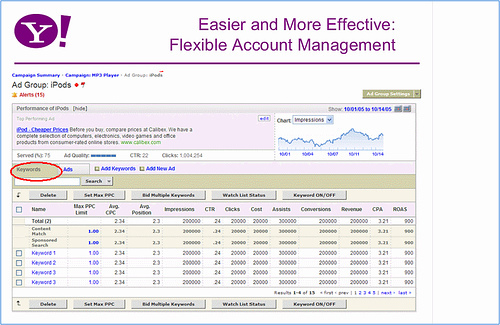 Cost Per Acquisition and CPA is also a feature where Yahoo will automatically optimize a site which is utilizing the Yahoo Search Marketing conversion tracking system. 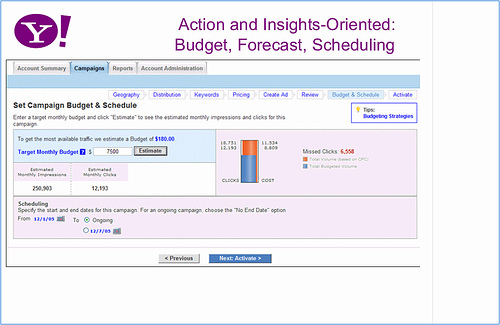 CPA budgeting brings the usability & positive experience from the third party SEM management systems into the Yahoo Experience. Assists are also added to the metrics of the application which helps track the target market search behavior and keywords searched for on the path to making that final purchasing decision – and makes that information available to the advertiser. Yahoo’s careful planning, usage of focus groups, pinging of their top advertisers, and slow rollout all seems to be paying off with the launch plans as today at Search Engine Strategies marked their first public display and presentation of the system to their basic advertising base. 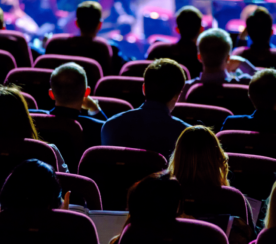 Such features as CPA targeting, expedited editorial approval, the slider payment solution and geotargeting resulted in a favorable response by the attendees of the special Yahoo session – even some clapping, hooting and hollerin’ by many in the crowd. Seems that Yahoo now has a rather large following in the anticipation of the 2007 rollout, which should be expanding by the day.